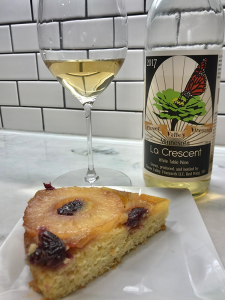 From the moment I first sipped Flower Valley Vineyards’ 2017 La Crescent wine, its long finish of sweet and tart pineapple flavor inspired me to try pairing it with a pineapple upside-down cake. Better yet? Let’s also put some wine into the mix. Enjoy! TIME: 1 hour, 20 minutes: 45 minutes to prep, 30-35 minutes to bake. I used a 12″ round pan, but this recipe works well in a 9″ x 13″ pan also. Slice the cherries in half, and add to a small bowl with 2 tbsp brandy. Stir gently to coat. Remove the pineapple rings from the can and blot on a paper towel. Lay the pineapple rings into a shallow dish and cover with 1/3 cup of wine (just enough to create a shallow pool for the pineapple to rest in. Let’s be honest – we don’t want to waste all the wine on baking!) Set the cherries and pineapple aside to soak for 30 minutes. Pour yourself a glass of wine, and onto the next step. Grease the bottom and sides of the pan very well, and then sprinkle the bottom with 3/4 cup of brown sugar. In a saucepan, melt 6 tbsp of butter on low, stirring gently. Strain the brandy used to soak the cherries into the butter mixture, stir gently and pour over brown sugar in the pan. Top with pineapple rings, and cherries (cut side facing up). Place one cherry in the center of each ring, and in-between pineapple rings also. Do you have a few cherries left over? I hope so! Go ahead and snack on those extra brandy-soaked cherries. Yum! In a large bowl, beat 4 egg yolks, then add 1/2 tsp vanilla extract, 1/4 tsp almond extract, 1 cup sugar and 1/4 cup wine (used to soak the pineapple). Very gradually fold in 1 cup flour and 1 tsp baking powder. In a separate bowl, beat 4 egg whites on high until soft peaks form. Very gently fold the beaten egg whites into the rest of the batter. Pour the cake batter into the pan, over the pineapple and cherries. Bake 30-35 minutes, or until a knife inserted comes out clean. Immediately after removing from the oven, run a knife around the edges of the pan to loosen. Let cool for 5-10 minutes, and invert cake to remove from pan. 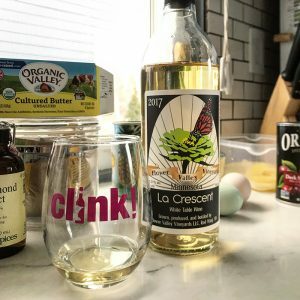 La Crescent wine has sweet/tart qualities, not unlike pineapple. La Crescent wine is also dominated by tropical fruit aromas and flavors (often, pineapple). If La Crescent isn’t a variety of wine you are able to find, you could also try a semi-dry Riesling, Spätlese (semi-dry to sweet) or Auslese (semi-sweet to sweet).